I'm still tearing through the books I got at BEA, but I did get two books this week! A huge fan of Jane Austen, Danielle hopes to find her own Mr. Darcy when she leaves Colorado to attend art school in London. Of course she knows it's silly to wish for that, naive even. But she's met enough males who lacked respect for women, a growing trend it seemed. And at nineteen...well.... However, on only her second night there she gets lost and is threatened by a stalker who proves to be immune to her martial arts training. Before she is completely overpowered, she is then saved by Ethan Deveroux. While Danielle does find the romance she seeks in Ethan, he's no Mr. Darcy. Her hero is held by a spell which fractures their chance at a happy ending. During the day Ethan is closer to mortal than immortal and can date her like any other man. Yet, as the sun sets, the powerful magic of an ancient curse returns and the evil of that spell is revealed. 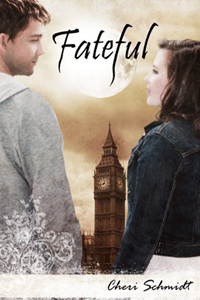 When that magic begins, Danielle's fairytale romance ends because Ethan Deveroux is a vampire. The summary of the book intrigued me, and I found I kept looking at it on the Amazon page. It's only 99 cents, so the price is good, too! Even though I'm trying not to buy many books after I got SO many at BEA, I figured I would check this one out anyway. Plus, readers kept comparing it to Twilight, which is one of my favorite books.